Hello all! I hope that those of you in the US had a wonderful holiday yesterday, and that those of you outside of the country are enjoying your Friday. I managed to get a few days off of work (Wednesday through Friday), so I’m quite happy. Anyway, today let’s talk nail polish. 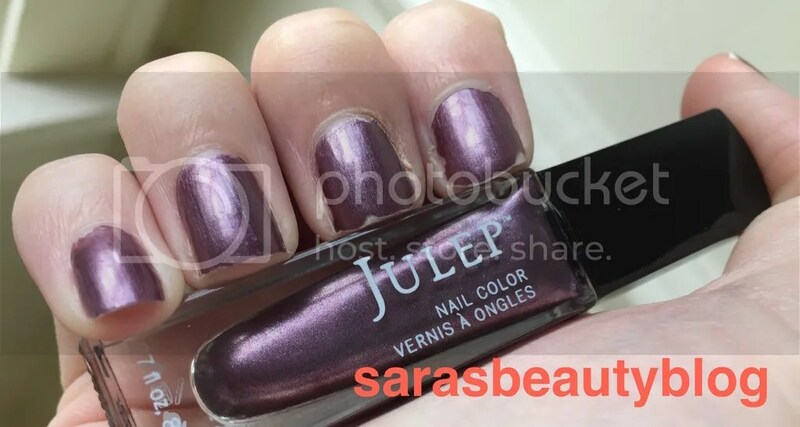 In my November Julep Maven box, I received this color: Julep Aubrey. Keep reading to find out my thoughts. This nail polish is a really pretty, metallic, muted purple color. It does change in different lights, looking more grey-toned or more of a bright purple. The metallic sheen is really nice and gives a fair amount of shine to the polish. Of course, a top coat will always make it even shinier (I did not apply one for this photo). In terms of application, I have no complaints. In two coats, I got a nice, even, and opaque coat on all of my nails. And you know how some metallic polishes end up looking streaky? This one didn’t do that at all. In terms of wear, I’m also quite impressed. This picture was taken several days after application, and there are only minor chips that you really can’t notice in real life. Overall, I’m really impressed by this particular formula, and I would say give it a go. Side note, Julep usually does some pretty incredible Black Friday sales, so if you are planning on purchasing anything (HIGHLY recommend the eyeliners called When Gel met Pencil or something like that), I would do that today! I am not getting paid for this post. I bought this myself. All opinions are my own. This entry was posted in Uncategorized and tagged aubrey, julep, nail of the day, nail polish, nail varnish, NOTD, photo, photos, review, reviews. Bookmark the permalink.